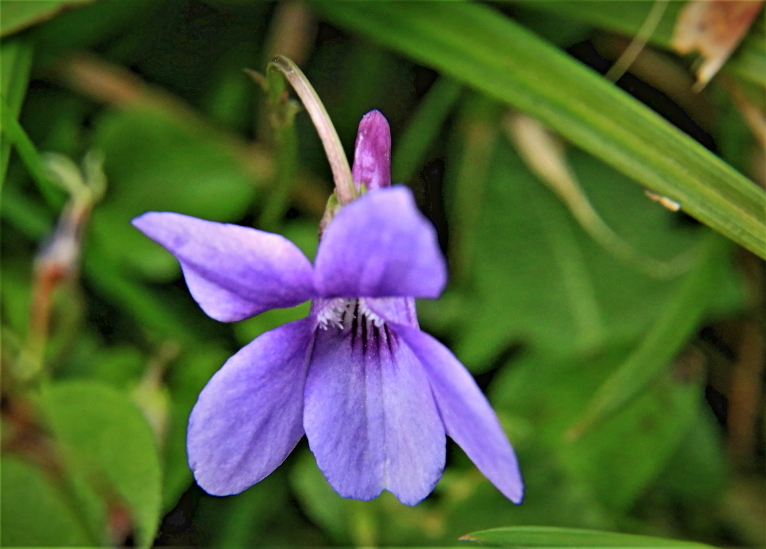 There are several species of violets and with a casual glance they all look quite similar. 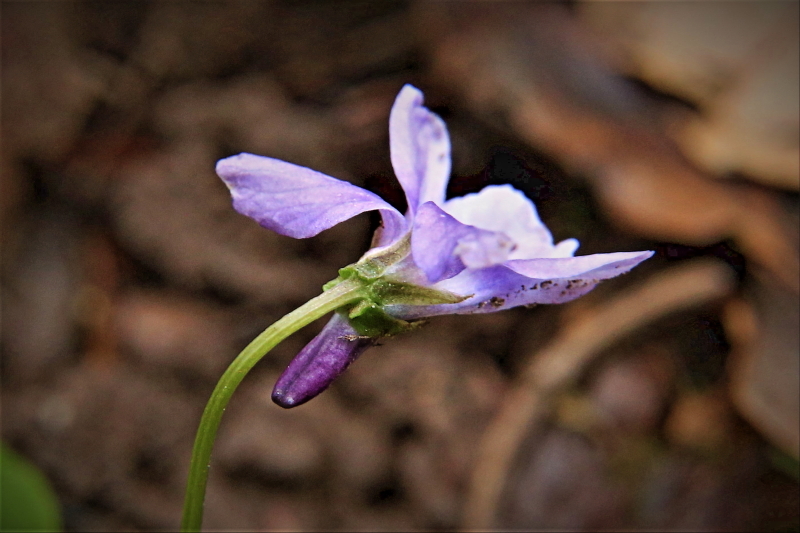 The one below is, as it happens a Wood dog violet but you need to look more closely to be sure. They flower from early March onwards. I have decided to deal with all three in one article so that comparisons can be made. In woodlands and shady place you could come across three different species. 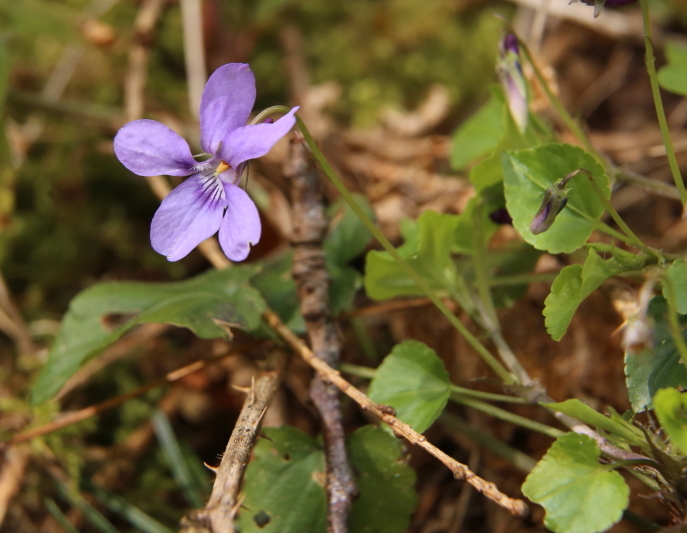 They are Sweet Violet Viola odorata, Common Dog Violet Viola rivinianna and Wood Dog Violet Viola rivenbachiana this is also called Early Dog Violet. To tell the difference you need to look closely at the flowers and know a little about the flower structure. Behind the petals there are sepals, these are green and protect the flower whilst in bud, they also remain after the petals have died and surround the developing seed pod. The sepals can either end in a long narrow point or they can be rounded, this is important. In the photo below the sepals are easy to see and they are quite obviously pointed. 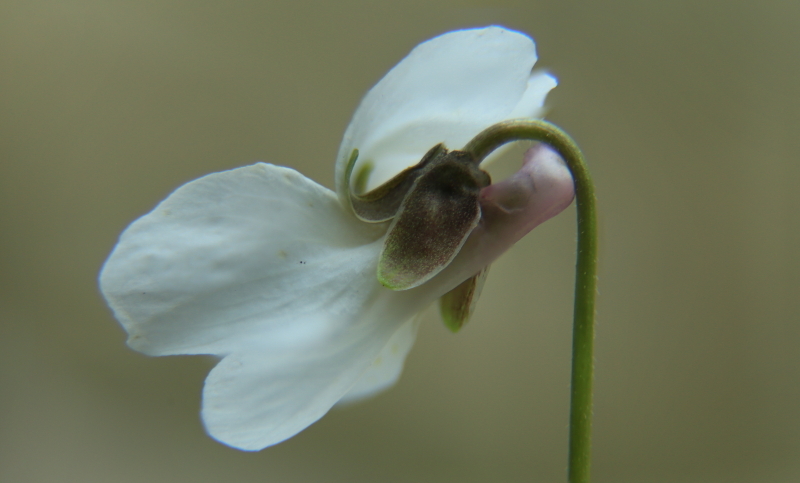 The next photo shows blunt or rounded sepals and this indicates that the species is the Sweet violet. This photo is of a white form of the species which is quite common. 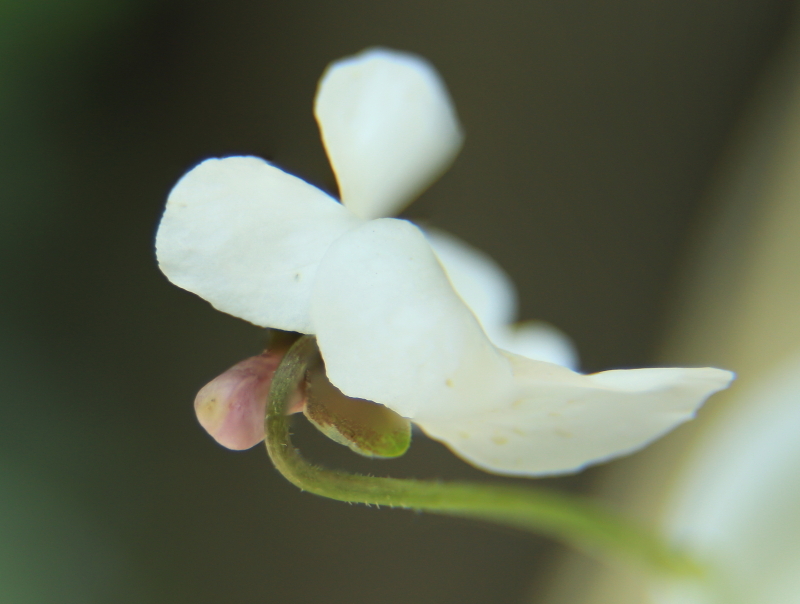 Also violets have what is called a spur which sticks out behind the flower. The nectar is produced at the base of the spur and bees have to stick their tongue down the spur to access the nectar. Some species like slugs have learnt that if you nibble a hole in the back of the spur you get direct access to this food source! Anyway the spur can be the same colour as the petals or it may be darker. Also it may have a groove running along the length of it or it may not. All of this is important. In the photo above you can clearly see that the spur is darker and it has a grove running along the length of it. Whereas in the photo below the spur does not have a grove. Finally you need to look for stolons, these are commonly known as runners, like what strawberries produce. If it has them then this also helps. So here is a check list. To finish off I will say that the reason for the name ‘dog’ is that it does not smell sweet…. ie is a bit of a dog as violets go. This is nice and easy ….just three species. However if we were to widen the subject and include all violets, not just those that occur in woods. then we have around 9 different species to consider and it becomes a bit more complicated. I have been asked about the smell of the Sweet Violet and why this is not used as a diagnostic feature. Well it can be used and if the violets smell sweet then they are Sweet Violets. 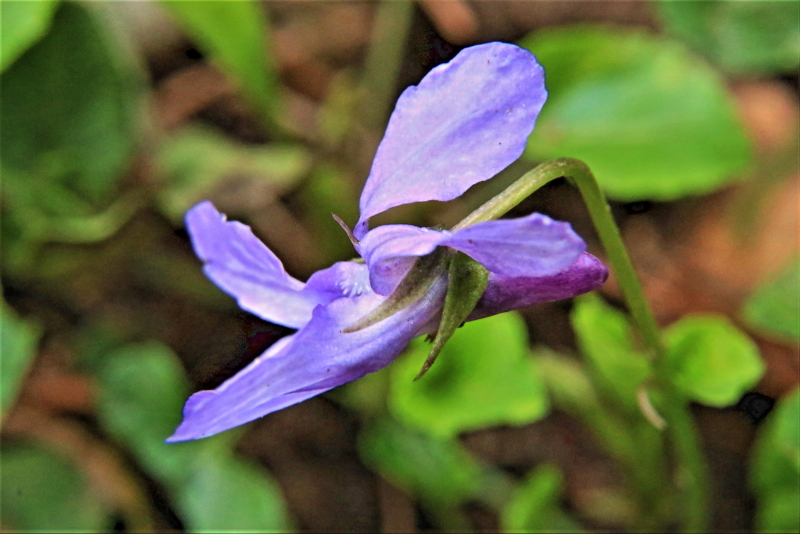 However life is often not that simple and some Sweet Violets have little or no smell, so it is sepal shape and presence of runners which is what are the definitive diagnostic features.